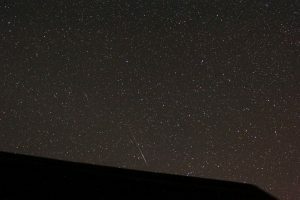 The night of August 12th (and morning of the 13th) should be a great time to view the Perseids from Farpoint Observatory. Every year at roughly the same day the earth moves through the dusty tail of comet Swift-Tuttle. The Perseid meteor shower usually produces about 50 -60 meteors per hour and at peak can deliver near 100/hour. This year the peak happens when the radiant is as high as it gets about 3:00 AM August 13th. The moon is completely out of the way too, being just a day or so of new. I plan to be there all night and I invite everyone to join in. Bring your sleeping bag or lawn chair preferably one that folds back horizontally, warmer clothes than you might think for mid August, bug spray, and if so inclined a camera (particularly with a wide field lens). All night restroom, coffee, etc will be available. It’ll be many years before we get another chance for an optimal Perseid shower. The general public is also invited to join in, but please leave those bright white flashlights at home. Dark adaptation is key for meteor shower enjoyment..